For all of my life, I have been a morning person. As a kid, I loved being the first person awake in the house — especially on a Saturday morning. That was prime television watching time, and I didn’t have to share the clicker. 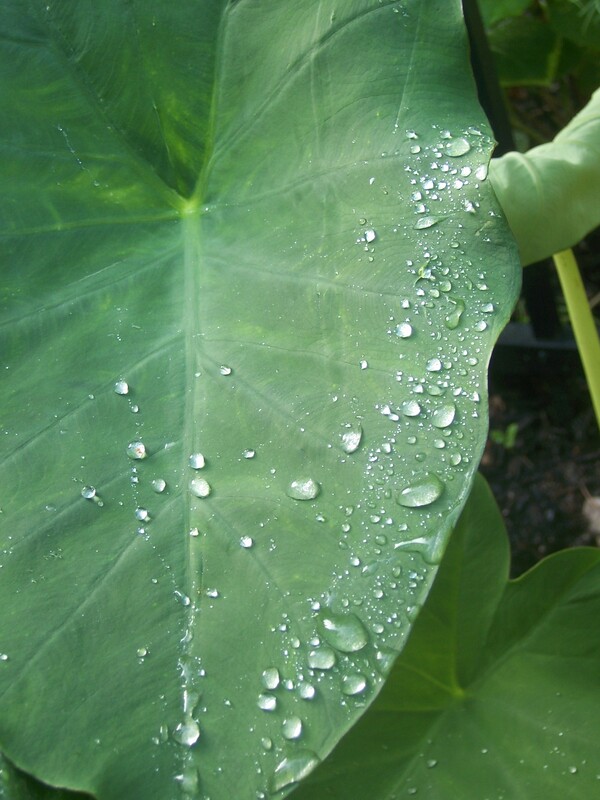 As an adult, my favorite morning is Sunday — it’s designed for pre-crowd food shopping, breakfast, a leisurely read of the newspaper, a crossword puzzle, and a nap — all before 11:00 a.m.
Drops of rainwater on an Elephant Ear leaf look like beads of liquid silver in this morning's light. Now that I’m on summer vacation, mornings are even more special. You see, I love my garden in the morning — and there are some times when morning almost feels like a religious experience. The light is soft. The air is fresh. As the sun starts to warm the air, the dew evaporates, so that the few rays of light are like beams. But it’s the human silence that I appreciate. For many of us, this is the closest we can come to feeling alone, as if we were the first person to set foot on this land. There are no lawnmowers revving. No cars and sounds of traffic. No voices. Just a non-stop soundtrack of songbirds — sparrows, robins, doves, cardinals — all stirring to greet the day alongside me. Yes, the garden changes throughout the day, and volumes of poetry could be written about the garden and the play of light and shadows as the day goes on. I just think there is more of an intimacy in the morning. The plants seem to agree with me. They appear rested and alive and alert, as if they are determined to put on their best show. While Joe and the dog and the cat and the neighbors are asleep, I’m touring the grounds, making mental notes of putterings to keep me busy. Not that it’s a lot of ground, but morning is a great time to look at everything. Armed with clippers and an empty bucket, I make my rounds — pruning, deadheading, weeding, watering, observing. The canna seem to grow taller each day, but aphids are having a field day on the smaller plants. I think the pot with the geraniums should be moved to that side of the yard, but get the impatiens out of the sun. The daylilies are getting ready to explode — I’ll check back on them later after the sun has done its magic. It’s that kind of thinking — and some may say this is just busy work or nonsense or boring — but for most gardeners, I believe our gardens are our therapy. It’s our time to breathe, to put the work of life on hold and to stop and smell the roses and the sweet peas and the morning glories and . . . Well, you get the idea. Of course, with each passing hour, the world begins to intrude on my serenity. Phones ring. Lawnmowers start. A speeding motorcycle whines on a neighboring street. Nevertheless, there is peace and satisfaction of a morning well-spent, and the knowledge that my garden and I will again have our time together in less than 24 hours — and when I look at the plants and flowers in the heat of the midday sun, I imagine that they have the same anticipation. I am NOT an early morning person, but the times I have been up early in the morning in my garden have been worth it. I have similar feelings about late afternoon. The air is cooler, the light is magical. You are so right about gardening being therapy. As for the religious experience — definitely! I agree with the afternoon light. It definitely changes the color and look of the garden — it was a warmer glow. Amen. Hi, Christine. Nice to hear from you. Absolutely — there is something very comforting to think of the promises and possibilities that each day holds for us. Besides, by noon it’s too hot to even think of gardening — unless I have the chance to run through the sprinkler as I water everything. Cheers!